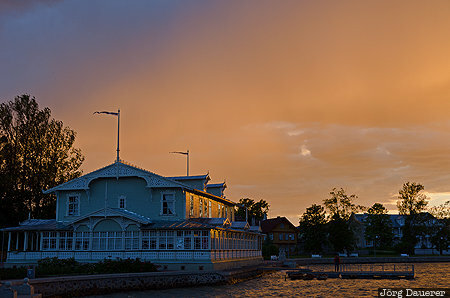 The impressive wooden Haapsalu Resort Hall at the seaside Promenade (Haapsalu Promenaad) at the coast of the Baltic Sea backlit by a colorful sunset. Hapsalu is in Lääne in the west of the Baltic state Estonia. This photo was taken in the evening of a sunny day in June of 2014. This photo was taken with a digital camera.